A throwback to when odd stuff happened. Indie games are renowned for appealing to the past. Some of them evoke older games thanks to their classic-looking pixel art style. Others, manage to bring back niche genres and forgotten gameplay mechanics, so often neglected by AAA developers nowadays. Not many of them, though, do all of that at the same time as they take you back to the actual 80s. Crossing Souls does just that. Crossing Souls art style is impressive and full of little details. 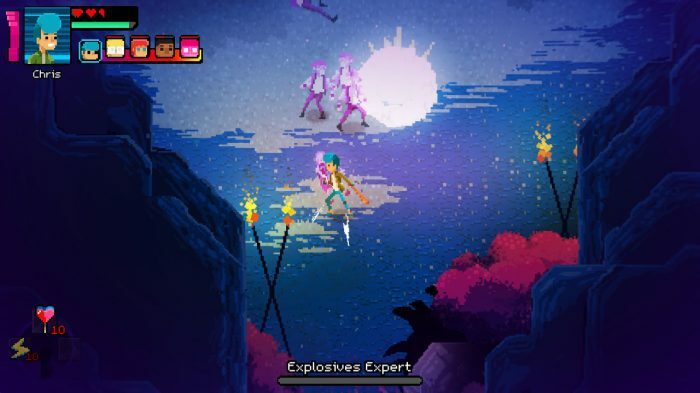 Much more than telling a narrative that takes place in the 80s, Crossing Souls seems to gather every single reference and cliché from that time and turn them into an amalgam of a friends-meet-stranger-things adventure. Similar to what we would see in a Stephen King or Steven Spielberg story, you’ll follow five friends on a dangerous adventure that starts after they encounter an artefact that allows them to peek into the world of the dead. It does hit hard on many of the tropes from this kind of narrative, as you’ll go from reference to reference during the whole adventure. Surprisingly, still, Crossing Souls manages to create memorable moments thanks to its relatable roster of characters and its superb presentation. That is where Crossing Souls truly shines. 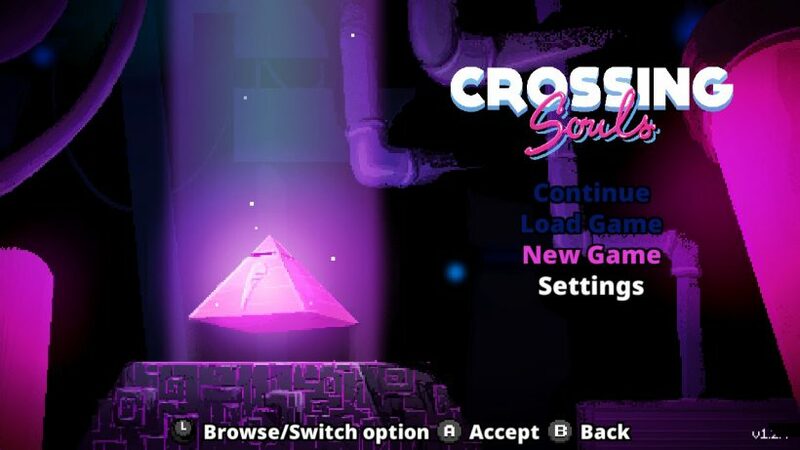 The whole adventure of Crossing Souls is portrayed with an astonishing good pixel art style, which has a very distinct colour pallet, with lots of neon-like tones of pink and purple. It creates a unique mood that mixes well with both the 80s aesthetics and the paranormal theme. 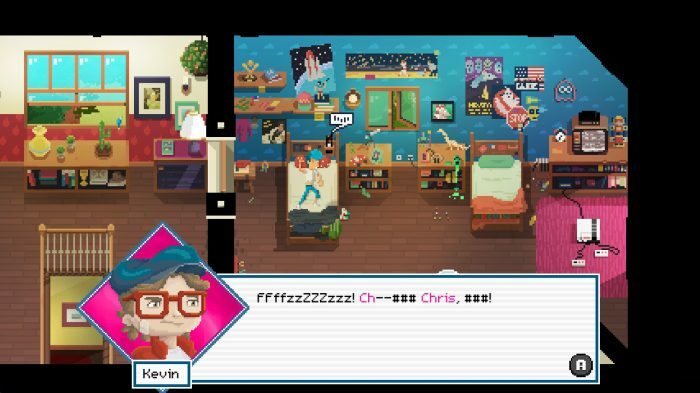 While the scenarios are presented within a top-down perspective, with LOTS of details everywhere, characters have different styles for their sprites in-game and their portraits during dialogues. Both are well-animated and full of personality, complementing each other. 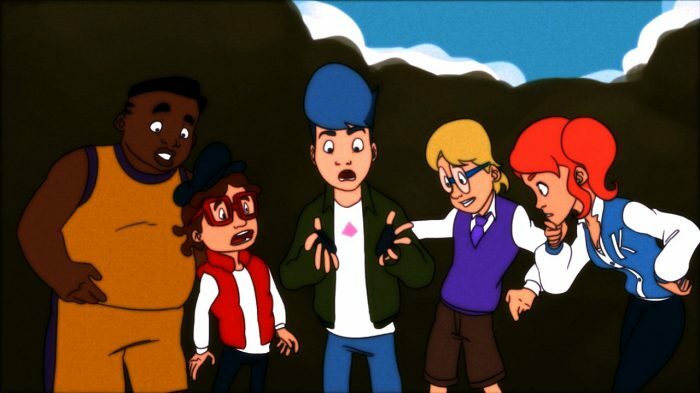 Also full of personality are the cartoon scenes you watch during the most important story segments – these seem to be taken directly from a Saturday morning show, VHS artifacts included. The cartoonish story segments adds lot of charm to the narrative. With such an amazing presentation, Crossing Souls could become one of the best indie games available on Switch. Unfortunately, when it comes to its mechanics, not all of its good ideas work perfectly. The combat feels like a simple but competent beat em’ up, with the catch that you can cycle between the five characters, in a similar way to Bloodstained: Curse of the Moon. They all bring unique characteristics to combat and platforming alike, but the fact that you get a game over if any of them die is a bit frustrating at times. What is more frustrating, though, is how much Crossing Souls focus on platforming segments. It is interesting how you need to use different characters for each challenge, with their unique skills, like climbing, jumping or hovering over the holes. However, due to the top-down perspective, I found myself having problems constantly, because I simply couldn’t get the differences between a platform and the ceiling of a building, and other similar things. Combat takes form as simple but competent beat em’ up. To take away more of the flavour from this almost-awesome game, I found some nasty little bugs during my adventure. There were many collision problems, where I get stuck on little corners of the scenario, and twice I had to restart the game, losing some progress. Despite these flaws, Crossing Souls was still a good game, and I don’t regret playing it, but it’s a shame that isn’t the unforgettable experience it could be. At a first glance, Crossing Souls is one of the most impressive indie games of the year thanks to its superb art style. Unfortunately, some nasty bugs and annoying platforming section takes away some of its charm.